Reversing his predecessor's decision to set up a diesel engine facility in Chennai, Hyundai Motor India's new managing director and CEO Han-Woo Park on Wednesday said as of now there was no such plan. "As of today, I do not consider a diesel plant, I do not have any idea. If the diesel market expands, then we will consider," he said in New Delhi. However, launching the diesel version of hatchback i20 in July this year, Park's predecessor Heung Soo Lheem had said: "Currently we are importing diesel engine from Korea. The production (from) the diesel plant in Chennai will start by the end of 2010." The new MD added that the company is currently carrying out a feasibility study for the plant, but remained non-committal on setting up the facility. "We are doing feasibility study for a diesel plant. But we need some volume for the diesel plant, without volume we cannot have an engine (diesel) plant. It will need huge cost. If we reach some diesel volume in India, then we can consider the plant. Nothing is happening now," he said. On shifting production of its latest offering i20 to Europe for exporting to the region, HMIL senior vice president (marketing and sales) Arvind Saxena said manufacturing of the car would start in Turkey in the second half of 2010. "Part of i20 production will be shifted to Hyundai's plant in Turkey during the second half of next year, mostly to cater to demands in the European markets. I think, around 50,000 units will be produced there annually," Saxena added. The company currently produces 100,000 units of i20 in India, of which 30 per cent is for the domestic market and the rest for overseas sales. Park said the company, which is the largest car exporter from India, will be emphasizing more on the domestic market and hopes to increase the share of its sales in India. "Currently, HMIL has a 50:50 share in sales in the domestic market and exports. We are going to focus more on the domestic market and the proportion of domestic versus overseas sales could change to 60:40 next year," he added. The company is expecting about 13-14 per cent jump in its domestic as well as exports this year with a target to sell a total of 560,000 units in 2009. 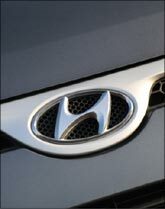 HMIL is also increasing its dealership base in the country to 320 outlets by 2010, from 274 at present. Wish Asin on her birthday!